You may be gravitating towards more affordable brands like Stanley and Craftsman for your tool purchases. These brands are targeted towards homeowner use and offer a wide variety of power and hand tools to select from. Its a longstanding debate about which of the two brands is better... and while we're not here to ​definitively answer it, we’ve compared ​Craftsman vs Stanely here so you can make an informed decision on which brand is the best for your next tool purchase. ​Both brands have been around for quite some time, producing a broad range of quality tools ​like socket organizers and wrench sets. Beyond that, the brands have expanded and even joined forces in recent years. ​Similar to the debate between brands like Ridgid and Milwaukee​, both Craftsman and Stanley are known for making very affordable tools. So, which is better? Let’s start with Stanley and the long and diverse history the company offers. Stanley has been manufacturing tools for over 170 years. It got its start in 1843 and has been a brand that homeowner and novice tool users turn to for their home improvement needs. The company was started by Frederick Stanley in New Britain, Conn. At the time it was known as Stanley Works – a fitting name for the manufacturer that produced its own tools from scratch. The start for the company can in 1854 when the company began manufacturing boxwood rulers. This transitioned to levels in 1857, and by 2015, the company had progressed to smart measuring technology. Today, Stanley is a brand that produces everything from automotive tools to woodworking tools and everything in between. It is well known for its leveling product line, with which it got its start in the market. Stanley produces its tools in the U.S.A., a trait that it is particularly proud to offer its customers. It strives hard for its reputation in the market and continues to introduce new tools to its lineup with continual testing and engineering to support its efforts. The company’s products are sold online and at retailers located nationwide. Craftsman also has a long and unique history with a bevy of hand and power tools that are aimed at homeowners. The company’s lineup also includes lawn and garden equipment and work wear merchandise. Craftsman entered the consumer tool market in 1927. At the time, its tools were owned and only available through Sears, but in 2017 Stanley Black & Decker bought Craftsman from Sears. Sears retains the rights to the tools for 15 years after the sale, and then it will pay a 3 percent royalty to Stanley Black & Decker going forward. The start of Craftsman began when Arthur Barrows, the head of Sears hardware department, bought the name Craftsman from the Marion-Craftsman Tool Company for $500. The company quickly grew, and Sears adopted the rights of the tools sold exclusively through its retail locations. Today, the tool lineup includes the Craftsman Professional, Craftsman Industrial, and the standard Craftsman line. This is an evolution from the many labels the company has used to sell the range including both the Dunlap and Sears names that were used on the standard tool offering from the 1930s to the 1950s. Today, its tool line is sold at retailers like Lowe’s, Menards, Ace Hardware, and Blain’s Farm & Fleet. ​Each manufacturer makes some tool sets that we highly recommend, and we review our favorites below. As you can see, Stanley makes a wide array of household and home improvement products. Focusing on their saws, they are entirely hand saws. Stanley doesn’t delve into the power saw product line, and doesn’t produce jigsaws, scroll saws, bandsaws, or table saws. ​Think of Stanley tools as a good fit for your basic tools in the garage as well. Wrenches, hammers, screwdrivers, etc... they do a great job producing these basic tools that we all have and need. When you're looking for a top notch socket organizer or a set of wrenches for your car, Stanley is a great brand to look at. So, are Stanley tools good? We have to say that for light everyday projects in your home or for your vehicle they will do the job well. But, if you are looking for a more professional grade tool, this is not the brand for you. ​The ​Stanley 92-804 30 Piece Socket Set is perfect for the novice to the average woodworker. Made with high quality steel and high-polish nickel chrome, this set comes with 27 quarter inch drive sockets, a drive universal joint, an extension bar, a pear head ratchet and (of course) its signature Stanley case. At it’s very affordable price point, this set contains a great variety of ​quarter inch sockets featuring multiple pieces of both standard and metric sizes. These sizes range from 6mm – 12mm, and ½ inch - 3/16​ inch, all etched with Stanley’s MaxDrive design. This specialized design​ helps provide 15% more torque and helps make tightening fasteners much easier and faster, while extending its life. In addition, its MicroTouch ratchets in the set belong to one of the smallest ratchet heads in the industry, allowing you to get into even the smallest of spaces. ​The tools also have a quick release button so you can easily change out the sockets faster and more efficiently. This kit ​is ​best used as a basic, in-home ​set you can use for emergency situations. It has all the common sizes you need, and they are all easy to find in its well organized case. The set also comes with a limited lifetime warranty, so as long as you don’t misuse them, you can have them repaired or replaced. However, if you’re looking for something more than the bare minimum, they also have a 69 Piece set. ​If you’re looking for something a bit more advanced, ​we highly recommend the ​Stanley 92-824 Black Chrome and Laser Etched 69-Piece Socket Set. Built with stainless steel and coated in black chrome, the set comes with 30 quarter inch sockets, 33 3/8 inch sockets, two drive pear ratchet arms, two spark plug sockets, two extension bars, a signature Stanley case and a color graphic sleeve. 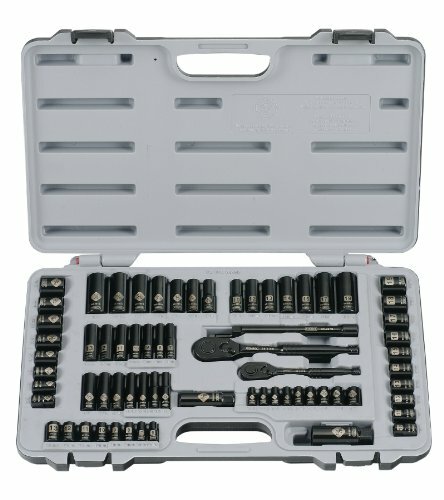 Sold at almost ​twice the price of the 30 piece set above, this 69 piece set is a really great value for when you need both quarter inch and 3/8 inch drives. They are also all designed with the same MaxDrive feature for easy fastening. ​Because of the black chrome, these sockets offer better corrosion resistance, extending its life even further. This set works great on all rubber, plastic, vinyl, leather or acrylic surfaces which can cover most of your needs, which is why we recommend this one for the beginner to advanced ​DIYer. Stylish and sleek, while also made from high quality stainless steel - this is a really impressive set of tools. The laser-etched labels make it really convenient to find what you need as well. Like the previous set, this one comes with a limited lifetime warranty, and is among the top rated on Amazon when it comes to Stanley socket sets. ​Complete with all the drive sizes and sockets you'll ever need, the​​Stanley Professional Grade Black Chrome Socket Set with 229 pieces comes with a whopping total of 229 pieces. Made with the same stainless steel material and coated in the same black chrome, this set is just as durable as it is corrosion resistant. It comes with all quarter inch, 3/8 inch, and half inch socket sizes as well as their corresponding wrenches. All this comes contained in the signature Stanley hard case ​for long term storage. It’s at a much higher price point compared to the first two we’ve mentioned, but unlike the previous recommendations, you can use this set for practically any job requirement you may have. T​he wrenches in this set also come with a reversible mechanism and a quick release button to make working with these tools much more efficient. This tool set is one of the highest value you can buy. It provides an extensive array of drives and tools, and provides you with a wide range of options for all of your needs. As it is a product of Stanley, the set is backed up by the same limited lifetime warranty along with all the others we’ve mentioned. If you’re still considering other brands and options aside from Stanley, we’ve also got some recommendations from Craftsman. While Craftsman produces even more products than Stanley, they seem to be on the same par in quality as Stanley. This could change with the Stanley acquisition of Craftsman, as they might want to create more distinct differences and product lines. However, that is nothing more than speculation. Craftsman, unlike Stanley, segments its tools into different grades. This can help you choose a tool for light-duty work and also one for heavier jobs. We wouldn’t necessarily say that the industrial or professional Craftsman line is up to par with other competitors in the market. But, it does give you more variety and choice as a consumer. 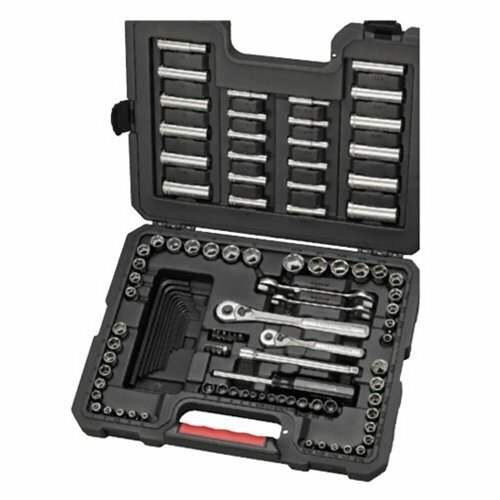 When you’re looking for more than just sockets, we recommend the Craftsman 009-38108 108 Piece Mechanic's Tool Set. 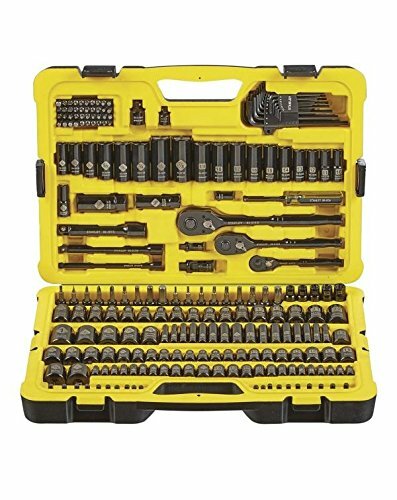 Not only does this set feature standard and metric 35 quarter inch and 34 3/8 inch drive sockets, it also comes with 14 hex keys, 10 screw driver bits, two quick release ratchets, four open end wrenches, drive accessories, and other specialty tools for your workshop. While there are over a hundred pieces to this set, the case is still small enough that you can fit it inside the trunk of your car in case of emergencies. Its range is wide enough for a beginner but not as extensive enough for an advanced tool user which is why it can be classified as a novice’s tool set. ​This kit is mainly identified as a good set for beginners who are in need​ of the basics. Although the set ​is put together with incredible value, it does not come with all the bells and whistles of a larger tool set. 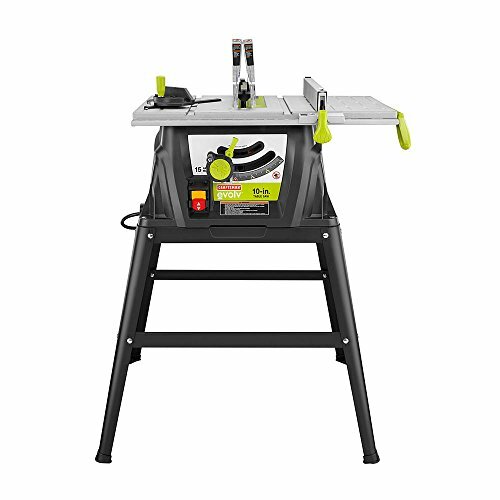 At 9.9 pounds, this set is made out of 100% alloy steel, a heavy-duty material great for long-term use, alongside a great lifetime warranty from Craftsman. This set can ​be a kick starter tool kit for your workshop. But if you want an all-in-one, the brand also offers a 230 piece set. 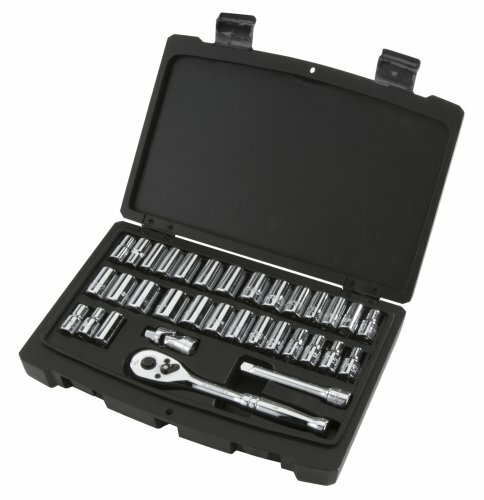 If you’re a professional mechanic looking for the perfect all in one companion, then the ​Craftsman 230-Piece Mechanics Tool Set may be for you. All of these tools are made from 100% alloy steel which is very durable and also has a glossy, silver finish that can be easy to clean and stand the test of time. At its’ price point, you get a bargain for all the tools and accessories included in this set​. You can use it for a multitude of purposes whether you’re working on repairing your car or fixing up your bike. ​We are personally impressed by the extensive array of tools and equipment that this set offers. In addition, the tool set's durability, which ​could last a life time. The set is great for regular maintenance jobs around the house, and even tougher, heavy-duty jobs as it has a lot of different sizes and tools all perfectly organized to help you find them quickly. 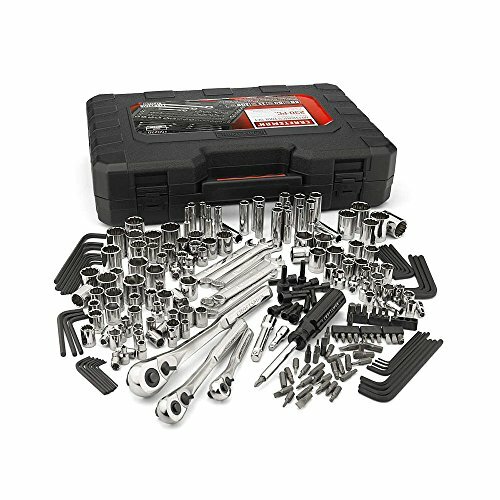 Overall, this 230 piece set from Craftsman is a good purchase when you want to have all the standard to advanced tools you’re going to need. You get the added benefit of being backed by Craftsman's lifetime warranty. To start off, when comparing Stanley vs Craftsman tools, we need to point out that these aren’t Bosch or Dewalt brands. That isn’t to knock either Stanley or Craftsman, but their quality is more in line with their affordable price point. Neither specializes in power tools, and both brands are better suited for hand tools and saws. When we look at the Stanley vs Craftsman brands, both companies offer really favorable warranties on their tools. Craftsman hand tools are guaranteed for life, and Stanley’s tools come with a lifetime warranty as well. This is outstanding coverage from the manufacturers. It wasn't always this way, but Stanley picked up on Craftsman's secret many years ago, and matched them with the warranty. Since then, the brands have been hard to separate. When we compare Craftsman vs Stanley, we see a clear advantage in the Craftsman line. It offers the larger product range, so you are able to find the tools you need for the applications you have at hand. Plus, Craftsman offers more power tool options which we just didn’t find in the limited Stanley range. Both brands are similar in quality, and the outcome of the marriage between the two companies remains to be seen. While we prefer Craftsman for product diversity, Stanley has a clear advantage in the look and feel of their tool sets. Stanley's Black Chrome Laser Etched 69-piece Socket Set, which we've reviewed below, has a clear advantage above any other Craftsman product on the market. We see Craftsman as the leader between the two brands, just because it offers more flexibility with its tool lineup and gives consumers more freedom in choosing a tool for the application they have in mind. Stanley’s saw product line only includes handsaws and hacksaws. There isn’t a lot of distinction in quality for a basic hand saw. More expensive versions have their advantages, but Stanley doesn’t produce any high end hand saws. Craftsman produces a limited range of power saws. In our saw reviews, however, the majority of their power saws don’t meet our qualifications for a top-end power saw. However, Craftsman does make one portable table saw that we really like. The B00LRY9DU6​ is one of many models offered by the company but we like the features, power, speed, and cutting ability this model offers. You’ll do well with this saw, and we recommend it as the favorite for home use. With the two brands owned by the same parent company, we thought there would be a lot of similarities between them. But, with the purchase of Craftsman only a year prior, there haven’t been any major changes in either product line yet. While Stanley and Craftsman both offer a wide array of home tools and equipment, we prefer the Craftsman brand for its flexibility and multiple product ranges.